Born on the 14th of March 1958; Daniel Meyer better known as “Danny” is the hotshot New York City restaurateur and CEO of the Union Square Hospitality Group. As of date; the USHG lists a range of restaurants which includes: Union Square Cafe, Gramercy Tavern, Blue Smoke and Jazz Standard, Shake Shack, The Modern, Cafe 2 and Terrace 5, Maialino, Untitled, North End Grill, etc along with other businesses like: Union Square Events, Hospitality Quotient and their catering division. He is also the proud author of the national best-selling book – “Setting the Table” and presently holds a net worth of about $400 Million. Other than that; Danny lives with his four children (Gretchen, Hallie, Charles and Peyton) and his wife Audrey Heffernan. How was Danny’s early life? Unlike many, most of Danny’s early life had been through ups-&-downs and being at the receiving end of problems, he had learnt most of life’s & business’s lessons at a very young age itself. Danny was born into a Jewish family from St. Louis, and his father was into a travel-tour business. He was raised in a rather reformed environment where he completed his schooling from John Burroughs School. Morton Meyer, his father had although spent most of his life in the travel-tour business but later jumped into the restaurant industry and ended up losing everything. Now although, he managed to open two of them— in Rome and Milan, with all the money that he had, but Morton wasn’t able to balance the ambition and finances. Eventually, with debts adding up, he was dragged into bankruptcy at the age of 42. This also led to the destruction of his marriage, which later led to his demise at the age of 59, when Danny was 32. According to Danny, what he lacked more than anything else was, “business disciplines” and “team-building”, which mostly were the reasons of his fall too! Anyways, during his college days, Danny used to lend a helping hand to his father as a tour guide in his business and later he had also returned to Rome to study international politics. In 1980, after completing his graduation in Political Science from the Trinity College in Connecticut, Danny had also briefly worked as Cook County Field Director for John Anderson’s independent presidential campaign in Chicago. Later in 1984, he went on to work for an Italian seafood restaurant in New York City called Pesca as an Assistant Manager. Although, that didn’t last for long, but he managed to learn a lot out of his first restaurant stint, after which, he returned back to Europe to study cooking as a cooking trainee in both Italy and Bordeaux. TRIVIA: Danny’s wife – ‘Audrey Heffernan’ also used to work as a waitress at the same restaurant, that’s where they met each other! Untold Story of Union Square Hospitality Group! Soon after leaving his restaurant job, Danny could feel that he was ready, he now had the resources, the money and the timing also felt right! Hence in 1985, at the age of 27, he withdrew all his savings & opened his first restaurant – ‘Union Square Cafe’. Now when Danny opened Union Square Cafe, he had initiated into a completely new breed of restaurants, which paired high-quality excellent food and wine along with warm hospitality and outstanding value. Apart from that, he had nothing else in mind! All he wanted to do was to scratch this entrepreneurial itch and open a restaurant, that’s all. Even though this was an odd career choice because not even one person in his family was in restaurants, but he just took the leap. Anyways, as the name suggests, it was based out of Union Square, which back then had vacant lots, boarded-up buildings, and seedy neighbourhood which used to get really scary at night. And what was even worse was that the fine-dining scene started as far as 40 blocks to the north. But what he saw in this place was something what others couldn’t see, which helped him make up his mind to lease the place. He saw that there was a Greenmarket, which unlike today, used to take place twice a week, and at the same time, what he had keenly observed was that, all the restaurants used to focus on either freshness & quality of food or quantity, look-&-feel and style, but there was no place which offered both. This is when Danny decided to give his customers both! And with greenmarket taking place near him, it would have only been beneficial in adding more to the quality and freshness of the food. And word has it that; the restaurant picked up like fire! Now Danny had seen his father fail & fall drastically, and he was in no mood to repeat his mistakes. Hence, it took him almost 9 years before he could even think that he was ready to open another restaurant. Even though he received many offers, he pushed them ahead, to make sure that everything was perfect, before he took the leap. After 9 years of wait, in the year of 1994, Danny opened his next restaurant – “Gramercy Tavern”, which again turned out to be a huge success too! Its success was also largely dependent on the fact that, by now Danny and his Union Square Cafe had become the talk of the town! Now that he felt confident, since then he went on a restaurant opening spree but at the same time maintained his level of precautions. He went on to open approximately one restaurant every four years, each of which required vast investments of time to meet his standards. 1998 – It began with “Eleven Madison Park & Tabla” in the year 1998, which were situated in a stunning art deco building near Madison Square Park. 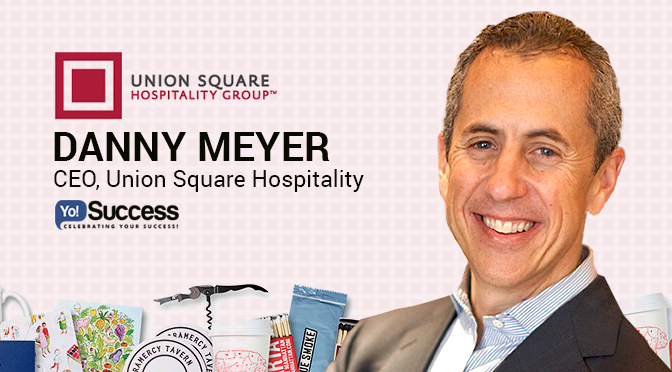 Following that, Danny also brought together all his restaurants under one wing and officially named his group “Union Square Hospitality Group”. 2002 – Later in the year of 2002, Danny experimented with another stint and opened “Blue Smoke and Jazz Standard”. Both of them offered real pit barbecue and top of the chain live jazz, along with warm hospitality which was surrounded by a fun and relaxed atmosphere. 2004 – In July 2004; USHG launched one of their most famous and highest earning food kiosk – “Shake Shack” in Madison Square Park, which served Chicago-style hot dogs, burgers, frozen custard, and a lot more. 2005 – In this year, they got selected by the Museum of Modern Art to create and operate the dining facilities at their newly renovated museum, hence, USHG opened three more restaurants, which included – “The Modern, Cafe 2 and Terrace 5”, along with catering, and food service for Museum’s staff. This was followed by the launch of USHG’s fine dining, full-service catering and venue hospitality business – “Union Square Events” (earlier known as Hudson Yards Catering). 2007 – Now the group seemed to be growing at the pace of light and nothing seemed to be stopping them. But an unfortunate event happened in 2007 which brought everything to a standstill. In the year 2007; recession hit the market and almost everything & everyone was suffering. This caused Tabla – their upscale Indian restaurant, to face the heat. They were going through huge losses but Danny was a person who always had been deeply loyalty to his staff. Hence, he kept running the business for more than two years, even with the losses growing. Finally, his leadership team at the Group, intervened and argued that keeping a sinking ship afloat was the worst possible way to take care of the staff and if he really cared for them, then the best way was to close the place and find another way to help them out. Convinced by that; Danny started to look for ways to help his staff and eventually, he was able to find other jobs for most of the team. Anyways, the recession also brought some good news for them too! 2008 – Shake Shack had begun spreading throughout Manhattan in 2008, which then further increased to Miami, Washington and then Dubai and Kuwait City. In the next three years, they had 13 branches globally and at the same time their restaurant holdings had also doubled. 2009 – Now till 2009; Eleven Madison owned Shake Shack, but soon after that it became a separate entity. This was followed by the opening of – “Public Fare” – a seasonal, open-air cafe located at Central Park. Along with that; Danny also went on to open “Maialino” – a Roman-style trattoria in the Gramercy Park Hotel, in the same year. 2010 – The hospitality industry highly lacked the understanding of hospitality itself and to fill in that gap; in 2010 USHG launched “Hospitality Quotient”, to help individuals and companies to understand and apply the power of hospitality in their businesses. 2011 – The group took the boldest move of their life when, “Eleven Madison Park” after receiving its highest rating of ‘four stars’ from The New York Times (Only 6 out of 26,000 restaurants merit such a badge of honour), a ‘Grand Award’ from Wine Spectator, and three stars from Michelin, sold the restaurant to their Executive Chef Daniel Humm and General Manager Will Guidara. Additionally, they also launched “Untitled” – a contemporary, farm-to-table take on the classic Manhattan coffee shop, at the Whitney Museum of American Art. TRIVIA: In 2014, Danny along with his family were hospitalized, after having “puffer fish” (one of the most poisonous animals) at a restaurant in Brazil called G1. Left half of Danny’s face was paralyzed for almost two week. And since then there has been no looking back for the group; they have just rose & rose & rose! Recently, the group’s most prestigious prodigy – Shake Shack made its debut on the New York Stock Exchange along with that its business also drastically boosted up from 7 locations and $19.5 Million in sales four years ago to 63 locations and $82.5 Million in sales today. Additionally, they have also added another bar called – “Porchlight” to their present kitty which now combines: Union Square Cafe, Gramercy Tavern, Blue Smoke, Jazz Standard, Terrace 5, Cafe 2, The Modern, Maialino, Untitled, Shake Shack, The Modern, Marta, & Untitled along with their other businesses i.e. Union Square Events & Hospitality Quotient. Today his fine-dine restaurants, feeds almost 3,500 customers daily, whereas Shake Shack alone feeds 12,000 users daily. It has taken Danny more than 26 years, to reach where he is today and to go from the owner-manager of a single joint to the C.E.O. of a group with such an immense stature that now employs over 2,200 people and oversees the operations of all his restaurants.